On the retirement anniversary, this month, of one of the greatest cricketers India has produced, here I am reliving the thoughts I had on that day. The numbers and statistics don't matter. The comparisons with fellow greats like Sachin Tendulkar, Ricky Ponting, Jacques Kallis, Brian Lara don't matter. The question of where he sits in the pantheon of cricketing greats, past or present, doesn't matter. And, most of all, it did not matter with whatever has happened in the Australian tour (2011-12) regarding the comments from some commentators saying the bricks are falling from The Wall. This is all because Rahul Sharad Dravid goes beyond all these things. All these things cannot quantify what Dravid meant to Indian cricket and to an Indian cricket fan in general. Case in point, the India-England series in 2011, The Oval. Day 4, sometime between lunch and tea. Being a cricket fanatic and a hopeless cricket romantic, even after losing the first three Test matches, I was following the fourth day in a nondescript room somewhere in the rural part of India, hoping against hope that India would, in some way, save this final Test. England has put up a huge first innings total. Due to Gautam Gambhir’s injury, Dravid has to open. He batted through and walked back, carrying his bat, on 146 not out. India was to follow-on. Gambhir hasn’t got any better, and there was no way he could come out to open. In my head, I began contemplating the options; like maybe Sachin can open (after all, he has done it so many times in ODIs, not a big deal for him) or there was even a VVS Laxman. But after almost five hours on the pitch, and just ten minutes of the innings break, there he was again. Dravid opened again. I sat in my chair, gobsmacked! I said to myself, what’s in it to be stunned? Isn’t this what he has been doing for the past 15 years? Putting team above self? 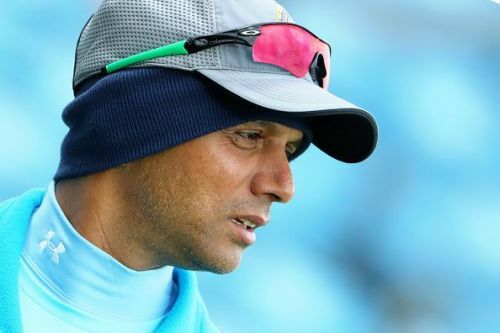 “Rahul Dravid is a player who would walk on broken glass if his team asks him to,” said Navjot Singh Sidhu. You have asked him to put on the wicket keeper’s gloves against his wishes, he did it. You have asked him to bat anywhere from the opening position to number seven, he did it. You have deserted him for two years after 2007 and asked him to help the team on the bouncy surfaces of South Africa. He comes back, helps in whatever way possible, and then you desert him again for two years, only to call him back, as Harsha Bhogle said at the time, at the first sign of a cloud, Dravid is your umbrella for the ODIs after the 4-0 Test drubbing in England. He again helps navigate the team through swinging conditions. Indian cricket has used Dravid, without him making a noise of any sort. But still, he is happy, saying he did what the team asked him to do. He retires being a content man. You ask every cricketer or a cricket fan, if the need is, whom he wanted “to bat for his life,” the answer would be unanimously Dravid. There was another side to it as well. When Dravid was struggling in 2008 and 2009, and in the tour just passed, he would make sure he makes the team the part of his battle. His battle was never with the opposition. You almost felt he was in war with his own mind. He sucked you into that battle. Rahul Dravid has been the impeccable personification of life’s harder battles, portraying those nuances. As with all good things, his value will be understood now; now that he is gone, and we are scratching our heads as to who will be that number 3? Who will play proper Test cricket, respecting the game’s age-old traditions, either skillfully ducking a bouncer or pulling it effortlessly, and the most important attribute of it all, the art of leaving the ball outside off stump and leaving no gap between the bat and pad while defending? Yes, it’s an art, without a doubt. If you didn’t enjoy Dravid’s art, then, unfortunately, you have missed the best cricket as a game has to offer. There has also been a lot of talk about Dravid being overshadowed for the most part of his career by some of his illustrious and, so to say, more flamboyant colleagues. He, being a humble man himself, doesn’t see any truth in it. He feels he was fortunate to be a part of such an era, and it helped him in a way that while the limelight was on others, he could free his mind and concentrate on his game rather than thinking what others had to say. I have an opinion on this. It is our fault if we felt he was being overshadowed. It was us who put him under the shadow because the media fed us what we desired to consume. We wanted Laxman’s 281 to be glorified more than Dravid’s 180. We wanted Sachin to be celebrated more than Dravid. We got what we wanted. Now, there’s no point ruing it. Personally, I feel I didn’t do justice to Dravid. Silently, deep down in my heart, I always wished him or one of the openers to get out so that I could see Sachin coming out to bat a bit early or after Sachin used to get out, I used to switch off my television and didn’t witness Dravid crafting one of those flawless gems. Such is the enormity with which Sachin has encapsulated my mind, I have never given Dravid his due. If by any chance, you get hold of this article, Dravid, I am sorry for the same. If you just take Sachin out of the equation, you will understand how great a player Dravid is! I know, I said damn with the comparisons at the start, but the mind is forced to compare. For me, he is the second greatest player ever to play for India, ahead of Sunil Gavaskar and Kapil Dev. That’s the biggest compliment I can pay him. Finally, I have to say as most others have said, cricket is poorer without Dravid. One of the last remaining gentlemen has left the game. It seems so fitting that a new documentary named ‘Death of a Gentleman’ is coming out in the same year when Dravid says goodbye. An era of classical textbook defence is over. With it, are we, indeed, watching the death of gentlemen’s game, the purest, absorbing form of cricket? When Dravid uttered the words, ''I leave with sadness but with pride,'' did it sound like the death knell for Test cricket as a whole? Only time will tell. The legacy of Dravid will be known in years to come. For the moment though, let me tell you, how I will remember Dravid. It has to be that shot, which I can imagine nobody else playing. I don’t know if it’s the death of Test cricket, but what I know is, I will carry the image of Dravid 'square cutting' the red cherry to my deathbed. Cheteshwar Pujara: The next Rahul Dravid!